The Quilters' Polygons Template Pack adds sixty new shapes to Kaleidoscope Kreator, including templates for 5-, 6-, 8-, 10-, 12- and 16-sided polygons. Polygons are basic building blocks for creating more intricate patterns and designs. Each template can be used in either kaleidoscope or pinwheel mode, and there are solid and frame styles for each shape. Quilters will especially love having these additional shapes to choose from when creating traditional quilt patterns, but this template pack is perfect for anyone who wants to create stunning geometric designs. 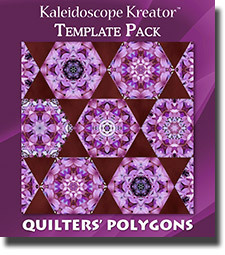 NOTE: The Quilters' Polygons Template Pack is an add-on product for Kaleidoscope Kreator, and can only be used if Kaleidoscope Kreator 3 or Kaleidoscope Kreator 2.0 is already installed on your computer.